Another new 4th grade lesson, another set of challenges and reiterations until I got it just right. 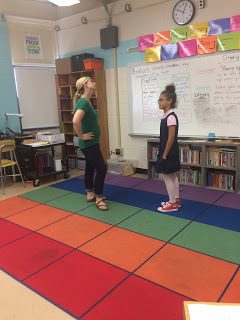 Our August B lesson in 4th grade continued our positive communication unit with a focus on body language and tone of voice. We started off with reviewing the questions we need to ask ourselves when we THINK before we speak. I was pleasantly surprised with how they did – win! Then we watched the Pixar Short “For the Birds“. little birds thinking and feeling about the big bird? feeling about the little birds? birds feeling, after they’d lost their feathers? volunteers be sending the body language message instead of you but mine weren’t ready for this just yet. Role Play #2: Student was asked to tell me what happens in their favorite movie. I leaned forward, kept a still body, used comfortable eye contact, and nodded. 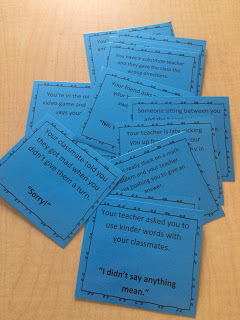 Role Play #3: Student was asked to give me a long list of excuses as to why they didn’t do their homework. I put my hands on my hips, pointed, rolled my eyes, shook my head, and had tense muscles. After each of those acts, I asked the class to describe what I was thinking and feeling; what message I was sending. Then they gave me specific “clues” based off of my body and face. What does tone of voice mean? both hands up if someone has ever told you to watch your tone of voice. something and then thought you should have used a different tone of voice. Next up was giving each pair a card with a scenario and a line of dialogue on it. They were instructed to: 1) read the situation, 2) discuss what would happen if they used the wrong tone of voice, 3) each take a turn practicing saying the words/line/dialogue using the correct tone of voice. Before we started, we talked about the importance of only practicing the correct way to say it so that the wrong way didn’t get stuck in our brains. We finished up with a quick exit ticket on a post-it. 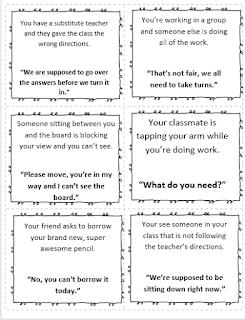 I asked the kiddos to identify a situation or scenario (pulling from the examples we used as a class if needed) that they have trouble using the correct tone of voice in and need to work on. 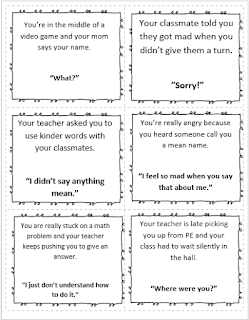 Most of them said it was when their mom was trying to get them to do something, and a few acknowledged they have trouble using a kind tone of voice when someone using a mean tone of voice with them first. In one of my classrooms, I did a 10 minute “Quiz, Quiz, Trade” with some discussion questions and task cards I came up with. If I was doing a longer lesson, or was able to make this a two-parter, I would use them as well. Looks like a wonderful lesson! I can't wait to try it myself! Thanks for sharing so much! Thank you, I'd love to hear how it goes! This lesson is great. Thank you so much. Can you share where we can get the scenario cards? Great lesson!